I love cooking on the weekends. This weekend, I have several projects going (trying to stay ahead of dinners for the week). 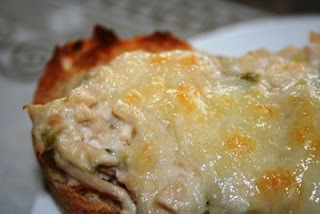 For some strange reason I was craving tuna salad yesterday, so I made open faced tuna melts for lunch. I don't have a recipe for tuna salad, mostly because I always use what I have laying around. For this version, I used one can of tuna packed in water, about 2 tablespoons of mayo, about 1 tablespoon of sweet pickle relish, about 1 teaspoon of dijon mustard, and one chopped up homemade dill pickle. Then I toasted a couple of pieces of Dev's home made beer bread, slathered on the tuna salad and a coating of grated swiss cheese. After a few minutes under the broiler we had a pretty delicious lunch!